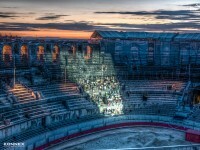 At the invitation of the LUMA Foundation, this summer twenty internationally recognised artists will come to Arles to work in its Roman Amphitheatre. 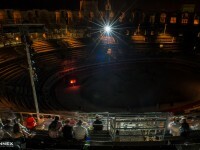 This important historical site, a major tourist attraction often used for bullfighting and festivals, will host an exhibition under constant transformation. 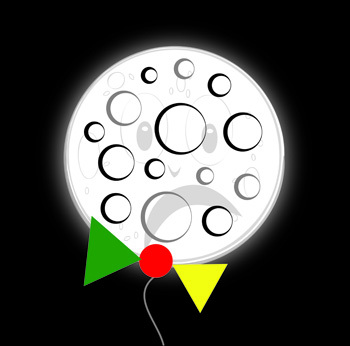 The title reflects its shifting nature and offers the promise of a journey: To the Moon via the Beach. At the start of the exhibition, visitors will encounter an arena covered in tons of sand. Over the course of the exhibition, the terrain will slowly be transformed from a beach to a moonscape by a team of world-class sand sculptors led by Wilfred Stijger. This site under constant motion will act as a backdrop to a series of interventions from the artists who will produce works in and around the arena. This unusual exhibition offers a foretaste of the future programme of the new centre for production of art and exhibitions that the LUMA Foundation will build at the Parc des Ateliers. This connection is also manifested in the re-use of the sand brought into Arles to create this shifting landscape. After the exhibition, all the sand will be moved to the Parc des Ateliers, becoming a temporary public playground imagined by landscape architect Bas Smets, before being re-used once again in the foundations for the main building designed by Frank Gehry within the new cultural complex. For this new collaboration Philippe Parreno and Liam Gillick (artists) together with Tom Eccles (Bard College, New York), Hans Ulrich Obrist (Serpentine Gallery, London), Beatrix Ruf (Kunsthalle Zürich), and Maja Hoffmann (LUMA Foundation)—who form the LUMA Core Group—have conceived an exhibition for Arles that takes visitors to the moon, via the beach. Conceived by Philippe Parreno and Liam Gillick. Curated by Tom Eccles, Liam Gillick, Hans Ulrich Obrist, Philippe Parreno, and Beatrix Ruf. 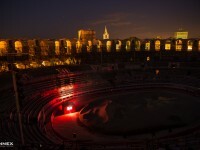 Commissioned and produced by the LUMA Foundation for the Parc des Ateliers in Arles.